Double Digits for Austin! I sat down with him and asked what he wanted to do for his 10th birthday. He didn't hesitate and replied I would love a Minecraft Party. Shock ... OMG what is Minecraft? :) After a few weeks I was getting used to the idea, lots of one on one with Austin learning all about his favourite game. We came up with lots of ideas to pull off a Minecraft Party for him and his friends. Here is the invitation Austin and I made. 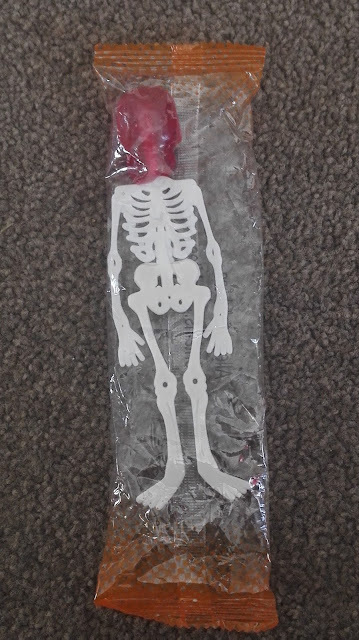 Steve is his favourite character so we had to make sure he was on the front. 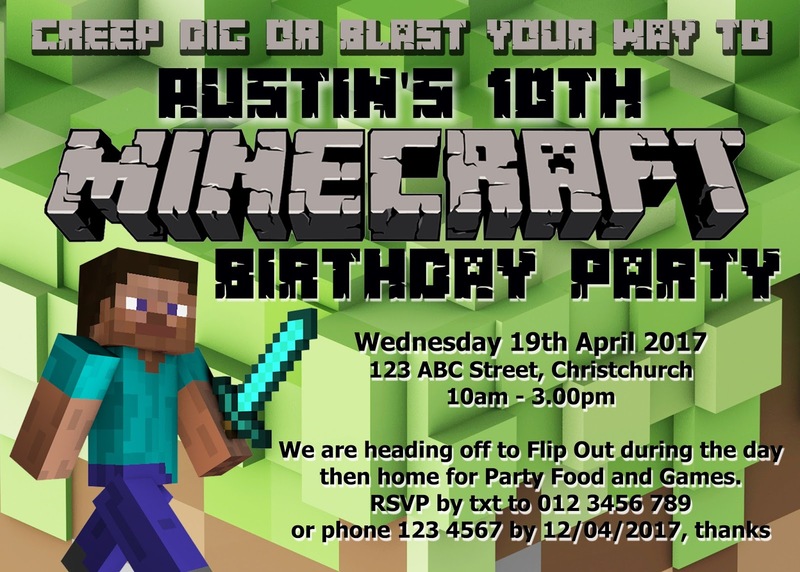 We downloaded the Minecraft font which made the invitation look so much better than we expected. I was quick to find Minecraft had been really popular a few years before, not so much now in the party item department. So I had to think outside the square. We did find a party shop that had Cupcake Wrappers, Serviettes, Plates and Cups so that was a start. Austin spotted a grass table cloth in the shop when we went to pick up the plates and cups so we brought that also. 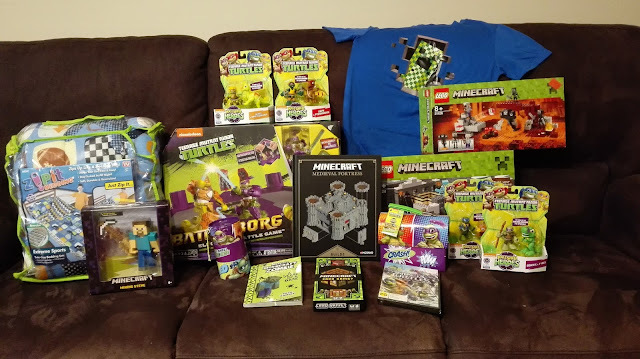 Austin had a few minecraft boxes of Lego so was busy making them up the week before. Thanks to Pinterest I got the hang of what Minecraft was all about. There were so many ideas. This is what we came up with. I brought a Minecraft Head from the Party store and taped up the eyes. Instead of wearing a blindfold the kids wore the minecraft head. Usually I would print a game but this was great fun to make using paper and great time with Austin too, who had so much fun helping. 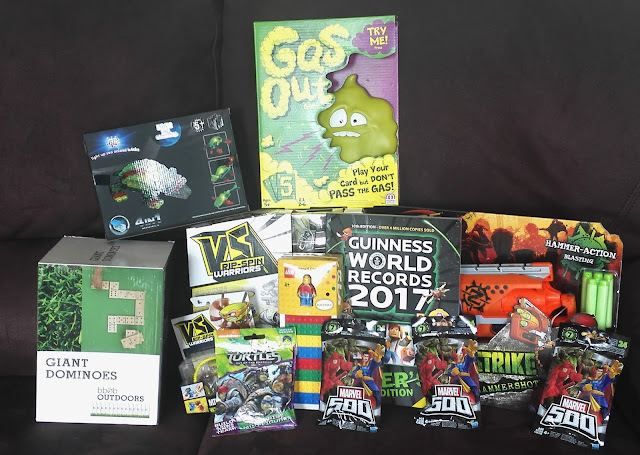 Prize for 1st place was a Minecraft Card Game. While out shopping for some inspiration I came across these great little Mining Kits at KMart. Each kit had a block with 4-5 minerals in the blocks to mine. There were all the tools you needs and a little black velvet bag to put the minerals into when finished. An easy Pinata this year, a TNT Box filled with lots of goodies. We got a box from the supermarket when we got the groceries, cut it to the size we wanted and covered it in red paper then added a label saying TNT. Kids always love a pinata and there were heaps of laughs and everyone cheering each other on while the pinata was being hit. Once again we used the Minecraft head so the older kids couldn't see what they were hitting. When I asked Austin what games he wanted to play he said the Chocolate Game. This is one of his favourites and since a block of chocolate looked like minecraft squares it was perfect. All of his friends sat in a circle and rolled the dice. When someone got a 6 on the dice they had to quickly put on the Minecraft Glasses and gloves and cut into the block of chocolate (one piece at at time). When another 6 was rolled the next person tried their hardest to eat as much chocolate as they could. They were such lovely kids they even passed their turn to others who hadn't had a turn yet, sharing out the chocolate. This really showed how amazing, friendly and caring Austin's friends all are. Years ago at my sons Scientist party we did exploding Coke Bottles. I thought this would be fun to do again but this time make TNT boxes for the Coke Bottles to stand in so they looking like Exploding Minecraft TNT's. I found Sort it Mini Bookcase Storage Boxes in Red at the Warehouse and thought these would be perfect and save me making something out of wood. I took them home and Rob cut holes in the top so the Coke bottles would fit through. I made TNT labels for the front and used sticky velcro dots to stick them to the front. On the day they were set up in the back yard and the kids all paired off. We had Steve Spangler Geysers to use. Between each pair they put the Mentos sweets into the Geysers and attached them to the Diet Coke Bottles. They stood back and puled the cord which drops the mentos into the Diet coke making them explode. To end off a full on day we hd fun with Crafting. I brought a box of Minecraft Paper Blocks at a fair, had some in the garage from years ago and also brought some new ones they kids could make and build with. It was a great way to end the day and also amazing seeing the imagination and friendships, working together to make great displays. Austin showed me the food that was in the Minecraft game so this made my job very easy. I had a list of foods, made food labels for the food I could find. Everyone thought it was great. Rob and I weren't sure there was going to be enough food so ordered Pizza's as well but there was so much food for everyone. The birthday Cake is always a stress for me, I usually get someone else to make it. But after sitting down with Rob we didn't as a team we could easily do a Minecraft cake for Austin. I made couple of Chocolate Fudge Cakes, some Rice Crispy Slice and Blue Jelly. Rob helped cut the cake into squares and we made a Minecraft Set for Austin using some of the toys he already had. Easiest cake ever, didn't even need a knife to cut it. We all sang happy birthday to him and he blew out his candles. When the guests arrived we played some games then headed down to Flipout for some extra fun. Flipout had opened last year and Austin had never been. As a surprise for him we took him for an hour of fun. The kids had so much fun jumping, flipping and laughter could be heard everywhere. He had such an amazing time. I got really cool little minecraft bags from Aliexpress. 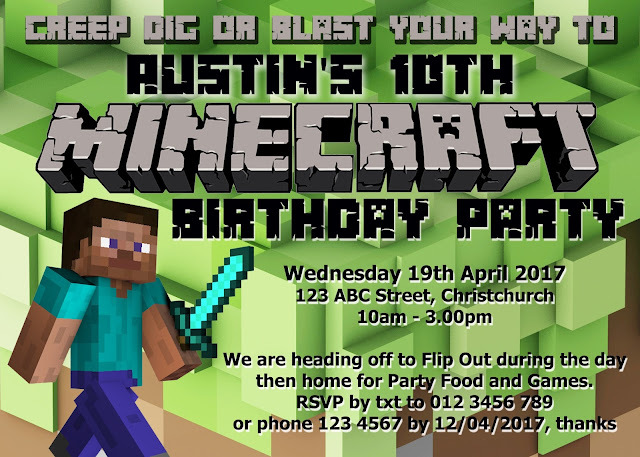 A very big thank you to everyone who helped celebrate Austin's 10th Birthday.